Tomorrow is the Pedol Peris and Stu McDonald is looking for marshals that can help to make the event run smoothly. The weather is looking fine so a good opportunity to get out and help. 9 Eryri Harriers competed in the Trailffest Trail race on Saturday 22nd September. Following a week of heavy rain and very strong winds, the previous Half Marathon race route was shortened to a 20k event due to fallen trees on parts of the H/M course. Weather conditions were quite good with hardly any wind and only light rain but, underfoot conditions were very wet and slippery in many places. Meirionydd club runner Alun Williams led from the off to comfortably win in a time of 1:22:25 ahead of runner-up Dan Collister 1:31:09. Leading Eryri Home was Ali Chant in 7th position with a time of 1:35:23 followed by: 10th Andrew Rowe 1:36:59. 11th Dylan Jones 1:37:17. 12th & 1st MV/60 Arwel Lewis 1:37:27. 32nd Steve Jones (SPJ) 1:48:25. 65th Maldwyn Evans 2:07:20. 73rd Dei (The Veg) Jones 2:13:35. 113th Judith Jones 2:32:55 and 139th Iorwerth Roberts 3:19:14. A very good, well organised event and despite being classed as a “Mountain to the Sea” Trail race. It is not all downhill! After the week of high winds and rain, it was an overcast but fine day for the 12th NWJMRC on the Great Orme, Llandudno. 70 children took part in the event, with 6 races covering the age groups under 9 to under 19. Records were broken in the U/19 and U/17 races by Mike Spill, Tom Wood and Lois Lee. Huge thanks to Mike Blake for his organisation, the sponsors and supporters – including Conwy BC, The Summit Complex, Xray minerals, Mostyn Estates, St John’s Ambulance, Great Orme Copper mines, and Sinclair Steel. Also, the marshalls (sorry I don’t have a list of all of you), timekeepers (Craig and Hayley), registration/results team (Ann/Sharon), Stuart on his bike, and all of the parents/grandparents/taxi who transported the youngsters and gave them the opportunity to have a go. See attached for the full results – if you spot any spelling errors, they are mine, not Ann or Sharon’s! Proceed from CP3 to SH 748757 and follow flagging to the finish. If anyone is interested in joining the Committee please don’t hesitate to contact a current Committee member for a chat. A number of officers are stepping down and we will need to fill those positions on the 20th. Mi fydd Ras Elidir fawr ymlaen flwyddyn yma Dydd Sadwrn Medi 22, cychwyn yn Nant Peris am 14:00, cost y’w £5.00 ar y diwrnod. Dewch i cefnogi eich rasus lleol. 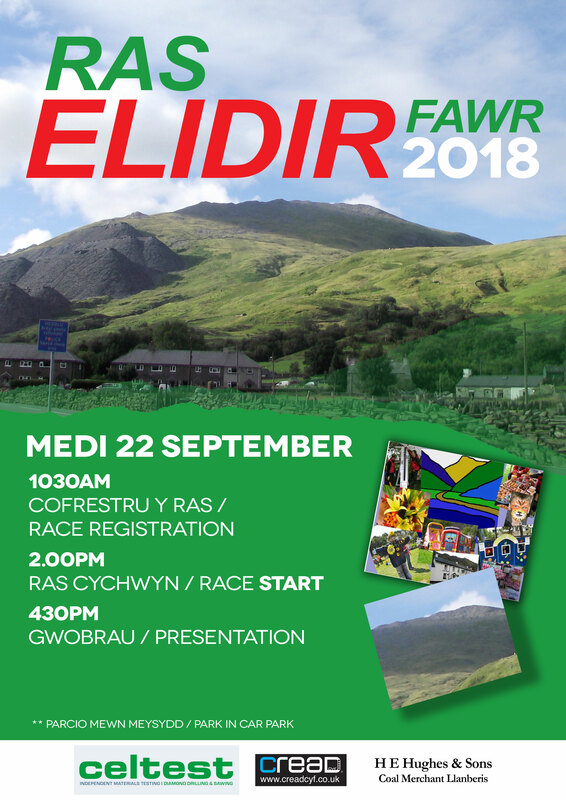 Eidir Fawr race will be on Saturday Sept 22nd at 14:00, race will start at Nant Peris, cost is £5.00 on day. Come along and support your local races. 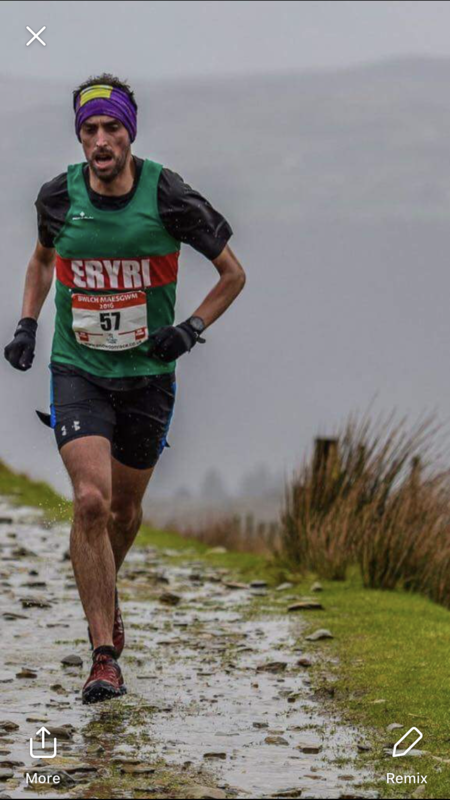 At Lake Vyrnwy, in a much less hilly Half Marathon, Dilwyn Rowlands finished 137th overall in a time of 1:29:05 (Chip Time) Only five seconds off his PB! 145th Tony Davies 1:29:41 (PB) and 309th Becki Law 1:40:52. On Saturday 8th September, Rob Samuel ran in his first ever Parkrun in Ireland! winning the event at St Annes, Raheny near Dublin in a time of 15:05.